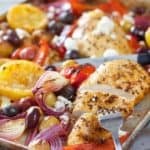 Greek Chicken Sheet Pan Dinner – Chicken and Fresh Veggies all tossed together in an easy and big flavored marinade. Spread on a sheet pan and you have a healthy dinner in 30 minutes or less! Chicken, peppers, onions and little baby potatoes all roasted up in a yummy quick marinade! Topped with feta and kalmatas. Such big flavor for a healthy and quick meal! This last 6 months has been a blur of Seattle rain and clouds. So what’s a girl, with a happy disposition, to do with all this gloom? Watch 7 seasons of Gilmore Girls, thats what! Yup, just finishing up the last few episodes. That’s 154 episodes of Lorelai and Rory with a dash of Luke, for a total of 115.5 hours of binge watching bliss! Do you ever just get trapped in a show? This one was so sweet. No blood or dead bodies…just a couple girls with the ability to talk faster than a gaggle of girls on a wine buzz. The sun better come out pretty soon or I’m gonna be forced to do something productive…Like make more Greek flavored dishes! (such a smooth segway huh?…brilliant writing skills. Just like Rory). Following up on last weeks Greek Salad Meal Prep with more Greek flavors. I loved the flavor of that chicken so much, I needed more! 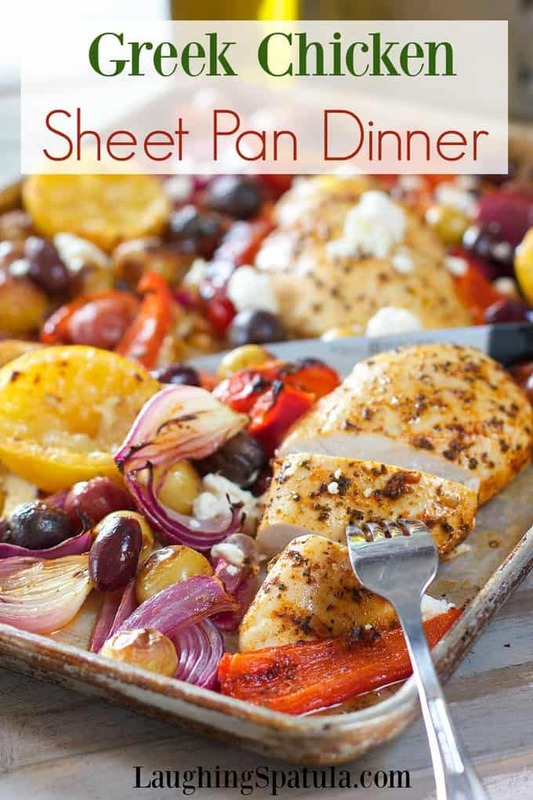 See how easy it is to make Greek Chicken Sheet Pan Dinner! A simple blend of olive oil, lemon juice, garlic and a few spices you probably already have. Mixed together and tossed with fresh veggies and chicken! Boy, doesn’t get much easier than this guys! 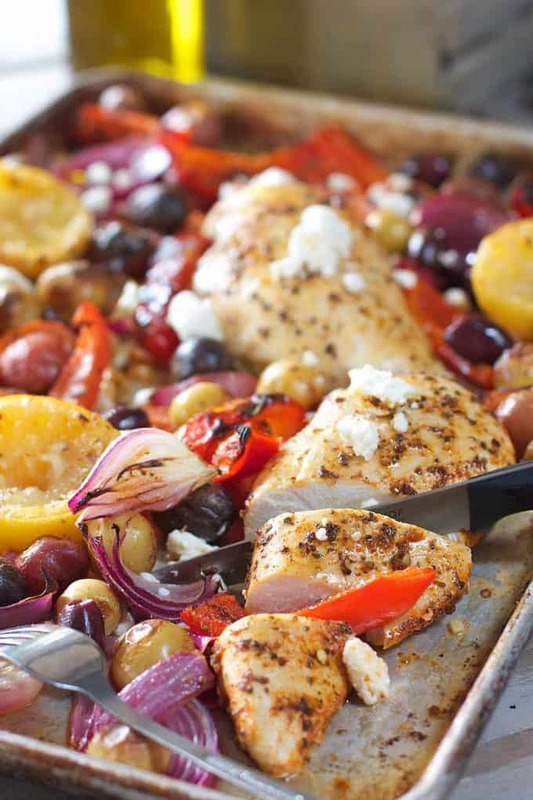 After only 30 minutes, remove your Greek Chicken Sheet Pan Dinner from the oven and sprinkle on the feta and olives! The next day, I took the leftovers, chopped them all up and made beautiful salads…which honestly, I loved so much that I’d make this again just for the salad opportunities. I served it with store bought Tzatziki dressing. Totally winner lunchbox! Now that you have this sheet pan dinner thing down…lets hear how many variations you can try! 1.) Add artichoke hearts or other veggies like carrots or even diced potatoes! 2.) Switch out chicken breasts for chicken thighs or even fish! (just add the fish 10 minutes into the baking time so everything gets done at the same time). 3.) Nix the feta and keep it Whole30 and Paleo. 4.) Double the batch for days of meal prep! Loving this sheet pan idea? You can see all of our Sheet Pan Dinners here. 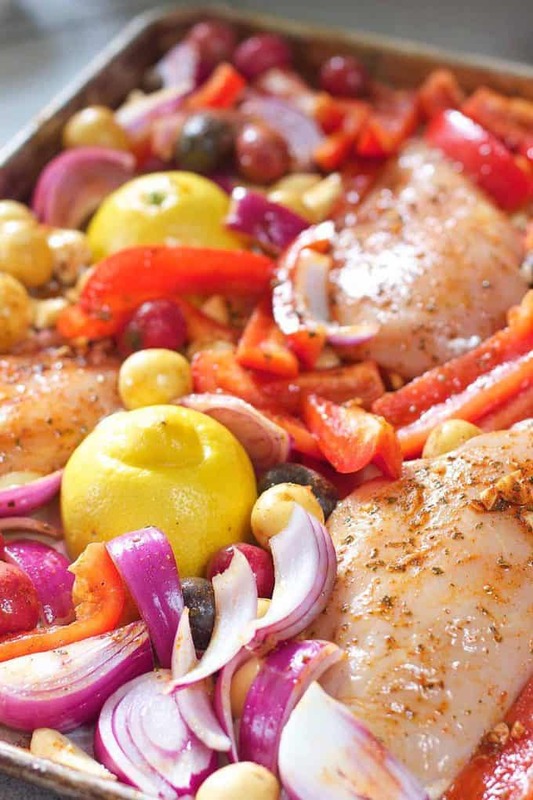 The most popular is our Chicken Fajita Sheet Pan Dinner. Served over salad, rice or in as a lettuce wrap! When we get tired of chicken, and that happens, we really love this Sheet Pan Honey Glazed Salmon Recipe! To Fast and Fresh Sheet pan meals and the Lorelai’s and Rory’s who love them! An easy one pan dinner that his healthy, fast and super yummy! Combine all marinade ingredients in small bowl. Place sliced veggies on large sheet pan. Place Chicken in and around the vegetables. Pour marinade all over veggies and rub onto the chicken. Arrange mixture evenly, and nestle sliced lemons around sheet pan. Place in oven and roast for 30-35 minute or until veggies are slightly brown and chicken reaches 165 degrees. Sprinkle with crumbled feta and kalamata olives. For my followers on the Whole30 or Paleo diet. You know what is best for you! If you see an ingredient that is not compliant, omit it. In this case, it's the feta :(. Thai Chicken Burgers with Kicked up Ketchup! I’m making this tomorrow but I have a few questions. I have lemon juice in a bottle. Can I use that for the marinade instead of fresh? Also, the whole lemons that go on the pan, do you squeeze them? & lastly, I have 4 thin cut chicken breasts-will that still be ok? Hi Jamie! Bottled lemon juice will work well enough and you can certainly use it instead of fresh (the lemons are indeed squeezed normally). 4 thin cut chicken breasts will be fine, but just keep an eye on them when they’re in the oven so they don’t end up too dry and overcooked. Hope you enjoy! This was fantastic and very easy to prepare. I’m allergic to bell peppers so I used grape tomatoes as a replacement and I added artichoke hearts to the mix. Delicious! Hi Joyce! I am so glad you loved it! Delicious! Did not have feta so used Parmesan. A new favorite in our house. How much lemon do you use? 2 tablespoons for the marinade and 2 whole for the sheet pan so you will need a total of 3! I updated the recipe to make it easier to understand. Thanks for the note! I have this in the oven now and OH! It smells so so so good and took me 10 minutes to put together. Yet another fabulous sheet pan masterpiece. Love your food Kathi!! Oh Rachel you are so good to me! Makes me so happy that you, a fabulous cook, like my recipes! Thank you for the note! I think I must be the only person on the planet who makes enough to serve 4 and has the same dish for dinner for two nights in the week. I remember hating leftovers as a kid, but part of that was because they were odds and ends put together to make a dinner, and they didn’t necessarily go well with each other. Part of the reason I like getting two dinners out of one time of cooking is that it greatly reduces the effort I have to put into dinner. Fortunately, my husband is fine with having the same dinner twice in one week. This Greek chicken sounds wonderful, like a dish I’m going to add to my recipe file. We both love Greek food, so I’m sure we will enjoy it. I’m new to your blog as of today and I am very happy to see the the first recipe I got was something I would want to make. Once again, my entire family LOVED one of your recipes! You are like my little secret chef whispering in my ear while I cook… and then I take the credit! Haha! All kidding aside, you really have a gift… and you help make a foodie family in Orlando… very happy! Well you just made this bloggers day thats for sure! 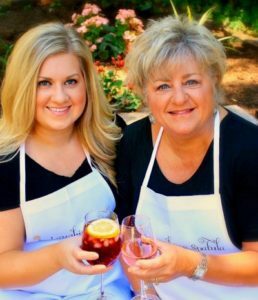 You are so sweet to send such a nice note Charna and I’ll do my best to continue to be your recipe whisper! I will meet you at Luke’s Diner for a cup of Joe! I just bought the OPA tzatziki dressing that you mentioned was your favorite, so I can hardly wait to make this one pan wonder and use the leftovers with my new dressing flavor! Thanks for the recipe, it looks SO yummy! Hi Susan! I love that dressing and Luke! LOL! Thank you for the note! Hi Pat! How are things? Where is the promised sun today! argh! I just realized I am not getting your posts! I changed email. Finally got a grown up one for my blog :). Resubscribing today! Hope everything is great! Is it because we live in the same geographic zone that we like the same flavours???? 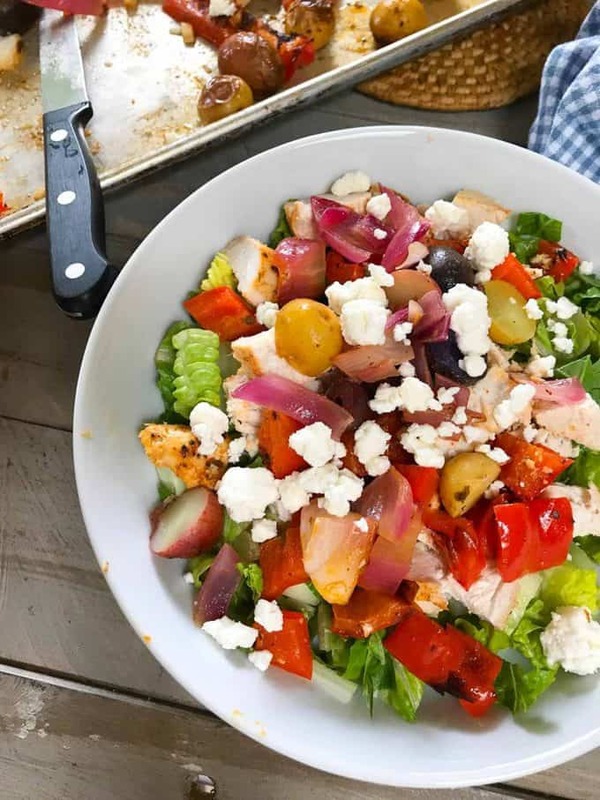 Your recipes always make my mouth water.I love anything Greek and this looks delicious. I’m also a Gilmore Girls fan! It must be Elaine! Hopefully we will get so some cool summer recipes soon! Love GG…gonna miss it :).